A small family run freehouse pub in the bustling village of Crudwell just 8 miles from Cirencester on the A429 towards Malmesbury, Wiltshire. We offer an extensive menu to suit all tastes ranging from Sirloin steaks to our delicious Smoked haddock and spring onion Fishcake, a wide selection of vegetarian dishes, childrens’ menu. We also have a range of freshly made daily specials. We have just added lunchtime range of Paninis During the summer months, you can enjoy a drink in the garden with your children at the rear or watch the world go by at the front of the pub. Come and see what we have to offer and enjoy a relaxing meal whilst we do the rest. We reserve the right to alter our opening times without notice. Bookings recommended for larger groups. The Wheatsheaf Inn is not quite a typical cotswold pub. The light and airy atmosphere is immediately apparent, somewhat similar to a wine bar ambience. The welcoming staff are always at hand to accommodate your individual requirements. 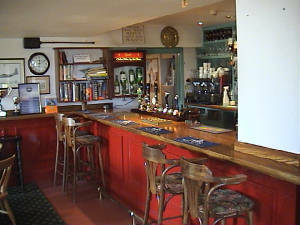 The Wheatsheaf Inn has a wide ranging and varied menu accommodating just about all tastes. The traditional homemade daily specials, the Indian spicy curries, the fish and steak dishes and the vegetarian choices. We are extending our lunchtime snack menu with the introduction of made to order paninis. For the special party menus that can be created around your individual needs we can provide set menus suited to your budget and specification.